BOURBON PULLED PORK SANDWICH – with VIDEO – Chandler Foods Inc.
For the Bourbon Sauce, flambé the bourbon in a medium sauce pot to burn off the alcohol and reduce it by half. Add the bourbon RTU, vinegar and apple juice concentrate and bring to a simmer. Fold in heated CHANDLER’S MAKE YOUR OWN PORK and bring back to a simmer. Set aside. 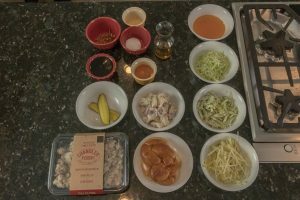 To make the slaw dressing, place the vinegar, and sugar in a small mixing bowl and whisk until the sugar is dissolved. Add the mayonnaise and hot sauce and whisk together. Adjust the seasoning with salt if needed and chill. Julienne the apple, fennel and cabbage on a Chinese mandolin and place in a large mixing bowl. Add a bit more salt to the slaw mixture and fold in the dressing. Assemble the sandwiches with the slaw on top of the pork. See video below with Chef Patrick Fea.